Over the past decade, interest in Japanese baseball cards has greatly increased across the United States. Baseball cards in Japan have been around in some form since the turn of the 20th century, offering collectors a wide variety of options. Modern cards in Japan present hobby enthusiasts with many of the same collecting choices as products sold stateside. There are actually many similarities between the baseball cards sold in the United States and the cards available to collectors from Japan. Collectors in the U.S. may be surprised to find that hobby interest has made many of these cards easier to access and surprisingly more affordable despite their point of origin. The appeal of Japanese baseball cards has increased greatly due to the fact that numerous players have made their way to the United States to continue their careers after successful stints playing in the Nippon Japanese League. Collectors naturally seek out their cards available here, but tracking down copies of the player's Japanese cards have also become a very popular trend with baseball card fanatics. Whether you have a favorite current player from Japan, or you want a new challenge as a collector, Japanese baseball cards have something to offer for all. Click on the headings or listings to shop for cards on eBay. The first Japanese baseball cards started to appear around the turn of the century. There were three main types of pre-war cards available to collectors. While many of these cards were printed during the first thirty years of the 20th Century, they are not too difficult to find and are much more affordable than American cards from the same era. The first "baseball cards" in Japan were actually Menko discs. Menko was a popular disc game in the early 1900s that can best be described as being similar to the pogs craze which hit the United States during the 1990s. The round cardboard discs originally featured different animals, trains, and historical figures. However, with the rise in popularity of baseball, the small Menko discs soon found themselves being used to showcase baseball players. The earliest Menko cards did not display specific players, rather they used generic pictures. Later, Menko cards strayed away from the round-disc design and took up a long, thin composition similar to a bookmark. Collectors looking to track down the older Menko cards can find a wide variety in terms of availability and price. Postcards of baseball teams and players were popular in Japan from the 1900s through the mid 1920s. Many of the postcards featured baseball teams that toured Japan during these years, including professional teams and college teams. 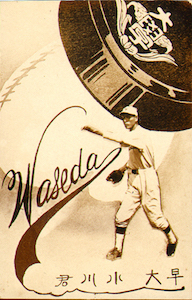 Some of the most popular postcards featured teams and players from Keio University and Wesada University, the two biggest baseball rivals before the forming of the professional league in 1935. Similar to the early Menko cards, the availability and price of these postcards range greatly depending on the subject of the photo. 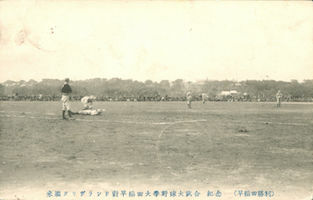 Bromides became popular with Japanese baseball fans in the mid 1920s. 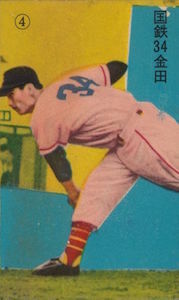 These cards were often printed on photo-quality paper and featured black -and-white or sepia photographs of popular Japanese college players, or visiting American professional and college players. Furokus were similar to Bromides, but were made closer to World War II. These large, glossy photographs were often inserted into magazines and are highly sought-after with vintage collectors of Japanese cards. The start of World War II in Japan began in 1937 when they invaded China. Due to limited resources, the production of baseball cards was essentially halted for almost a decade. At the same time that Japan was invading China, the Nippon Professional Baseball League was formed. Since the production of baseball cards came to a standstill during the war, most of the early professional players in Japan did not have baseball cards. The few examples that do exist are extraordinarily rare and pricey for collectors. Following the end of World War II, baseball's popularity exploded in Japan. It was during this time that tours of American baseball teams to Japan became a yearly event. Most of the baseball cards made during the occupation years were in the form of Bromides and Menko cards. However, the printing of these cards was often done locally and there are literally hundreds of different Bromide and Menko sets from this era. Baseball card collectors in Japan were also introduced to candy and game cards. Again, the cards during this era are affordable and not too difficult to find depending on the player featured on the card. After the occupation of Japan ended in the early 1950s, the pre-war version of the Menko cards disappeared and the production of Bromide cards declined drastically. During this era, many of the Japanese baseball cards were issued by gum and candy companies. While the pre-war Menko cards faded, the tobacco-sized Menko cards became en vogue with collectors. Both the candy cards and tobacco-sized Menko cards are popular with collectors, but they do present certain challenges. It was also during this era that baseball card collectors in the United States were exposed to Japanese baseball cards with the release of the Kabaya Leaf set that was available in both the U.S. and Japan. The candy cards were often produced regionally, which has made it tough for collectors to assemble checklists of them. The cards were also printed on thin, inexpensive paper, making it difficult for many of the cards from this era to survive. The candy cards that have survived and remain in good condition are in high demand with collectors. These cards are often harder to find, and are more expensive, than many of the pre-war Menko and Bromide cards. 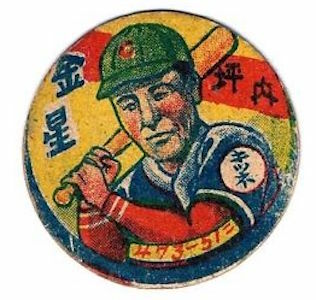 The tobacco-sized Menkos became popular in the late 1950s and dominated the world of Japanese baseball cards for almost a decade. The undersized cards were distributed in small sets which focused on the star players in the Japanese Professional League and were issued in envelopes normally containing one card per pack. Some of the packs had two cards together, which were then cut apart by the collector. This has made it common to find these cards with uneven edges and borders. The price and availability of these cards can differ greatly. Towards the end of the 1960s, the baseball card hobby in Japan had entered another lull. However, that came to an end in 1967 with the issue of the Kabaya Leaf set. This 105-card set featured players from the Nippon Professional League on two different styles of cards. The set is fairly rare in Japan, but in an odd twist, the cards were imported and sold around the United States. While they are also considered rare in the United States, they are more prevalent here than in Japan. In spite of it's rarity, the Kabaya Leaf set is popular with collectors on both sides of the Pacific. Even the common players in the set can demand a hefty price, especially for cards with high professional grades. In the years following the release of the Kabaya Leaf set, the popularity and production of baseball cards spiked in Japan. Numerous card companies began to produce sets that were widely available to collectors there, but the most popular card manufacturer was Calbee. Calbee was actually a potato chip manufacturer, but starting in 1973, the company produced an annual set of baseball cards. The sets varied greatly in the size, and the formatting of the cards changed from year to year. 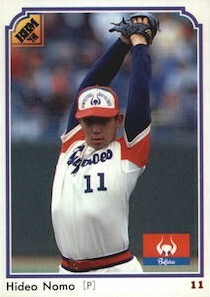 In the late 1990s, the design changed to match American baseball cards. The Calbee sets are highly collectable and in demand, but some of the sets are very tough to assemble because the cards were distributed in bags of potato chips, one card at a time. These were mainly sets from the 1970s and 1980s. 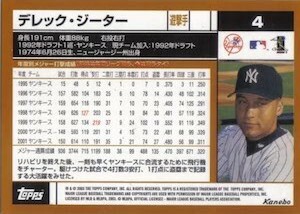 The more modern Calbee card releases are not too difficult to encounter in the United States and collectors often pursue copies of cards from players who have crossed over to play in the United States, or vice versa. 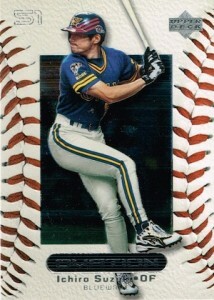 BBM began production 1991 and modeled their baseball cards after current American ones. Their sets featured modern Japanese players and were marketed in both the United States and Japan. Similar to modern card manufacturers in the United States, BBM has increased the number of sets produced over the years to include premium products, specialized sets featuring older players, All-Star sets, and Japan Series sets. BBM cards are highly collectable and widely available in the United States. 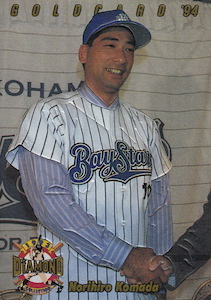 Since the timeframe on the rise of BBM directly correlates with rise of Japanese players stateside, many card collectors have taken up finding cards of players like Hideo Nomo, Ichiro, and Hideki Matsui. Similarly, American collectors have also been able to find former Major League Baseball players who have found success playing in Japan such as Cecil Fielder and Karl "Tuffy" Rhodes. Other card companies have produced popular sets during the past twenty years, which are considered the modern era of baseball cards in Japan. Two of the most popular card products outside of BBM were Q-Cards and Kanebo cards. Q-Cards were small, plastic cards that are hard to find and can be pricy. The Kanebo brand is also popular with collectors of Japanese cards. These cards were produced on thick card stock and featured foil print. The Kanebo cards are available in the United States and the cards can be quite affordable. 2013 BBM Japan#E87 Masahiro Tanaka BGS 10 PRISTINE Yankees 175 Million-Cy Young? 2012 BBM Japan #E88 Masahiro Tanaka BGS 9.5 GEM Yankees 175 Million-Cy Young? 2007 BBM #700 Masahiro Tanaka ROOKIE BECKETT 10 Yankees 175 Million-Cy Young? Two of the biggest card manufacturers in the United States have made ventures into the world of Japanese baseball cards. Upper Deck made four baseball card sets in the early 2000s that featured Japanese baseball card players. The Japanese Upper Deck sets are widely available in both countries and are affordable for all collectors. 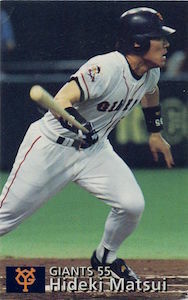 The most popular of the Upper Deck sets produced for the Japanese market was the 2000 Ovation set. This set featured numerous Japanese players who made their way over to the United States, including Ichiro and Daisuke Matsuzaka. Topps has also produced Japanese baseball cards. One of their first entries in Japan was the 2002 Kanebo set. These cards used the front design and photographs from the 2002 cards, but the backs of the cards were written in Japanese. The set was sold throughout Japan. Topps issued a similar product again in 2003. 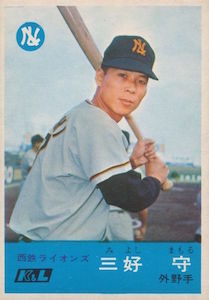 The Kanebo cards are extremely popular in the United States and the cards carry a premium with baseball card collectors far above the normal Topps base card. Topps has also started to produce exclusive baseball cards for their Asian markets that are focused on collectors in Japan and Taiwan. Sets such as the 2013 Topps Supreme set were only sold overseas in these two markets, but have a heavy following in the United States and have become extremely popular. Topps has also produced cards sold within the framework of products offered in United States that have extra cards that are exclusive to collectors in Asia. 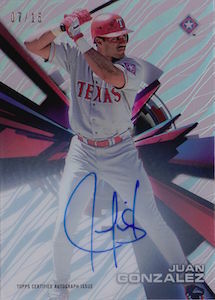 For example, in 2014 the Topps Tier 1 product featured a set of red ink autographs that were only in boxes sold in Asia and in 2015 Topps Tek, an exclusive pattern is available. 2014 Bowman Draft Hobby Box Asia Edition - BRAND NEW & FACTORY SEALED!